Paper Daisy Crafting: Oh so Eclectic from Stampin' Up! 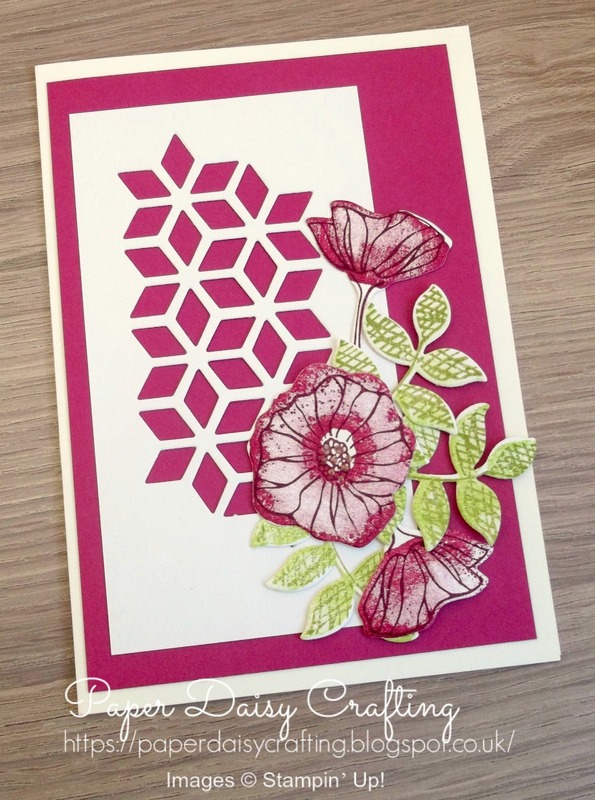 Oh so Eclectic from Stampin' Up! With all the excitement of Sale-a-bration and the Easter festivities now over, I am taking time to take another look at products from the sometimes neglected Annual Catalogue. I have to make a confession - I have so many stamp sets that I haven't even inked up yet. Today's sample showcases the "Oh So Eclectic" bundle of stamp set and dies. This set didn't immediately call to me when I saw it in the catalogue but as often happens, I then started seeing samples made by others and realised I had to have it! The sample I am showing is completely CASED (copied in this case!) from one I received as a swap at a Stampin' Up! event. Unfortunately, I've lost the details of the person who made it so I'm unable to credit them. 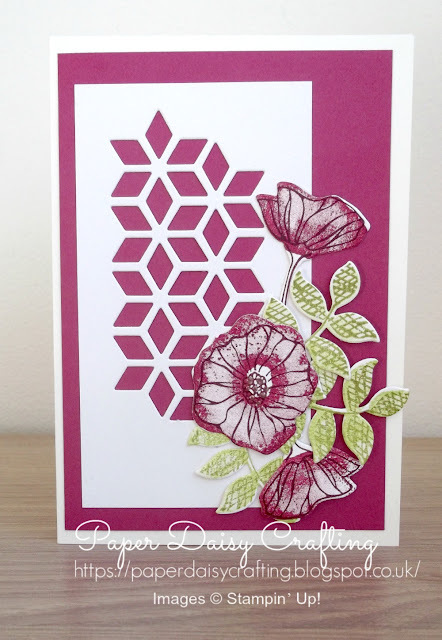 There's so much I love about this card - the geometric background die -cut, the leaves which look as if they've been hand coloured and the fact that there's no sentiment or message so this card could be used for any occasion. Oh and can you see that little bit of copper heat embossing in the centre of the flower? Thanks for dropping by today - I have another video tutorial for you tomorrow so don't miss that!